Thank you, Edgevale, I look forward (if that is the right term) to following this thread. I fear that there are many, many more. My mare was, I am sure, Long gone before all this came into the public domain. And what about foals they bred that none of us know about? I suspect if they were not deemed to be suitable to forward Evil's, sorry, Evie's, eventing career they were just left to starve in the fields; we will never know the full horror of all this as they have no shame and care nothing for the suffering they caused. And they still have horses!!!!!! Are they being checked? Can't someone go up to there property and check which horses have been returned to them?? Sadly not as they are on private property so that would be trespass and if it was one of us who was concerned with the case it could be construed as harassment. Sparky was such a gorgeous pony. I didn't even recognise him from the photo that was used in the paper until Laura mentioned his name, Vlacq Tinwe. Red's uncle. Speechless. So what happened to the foal/foals? More to add to the humungous list of horses??? I think this thread will horrify some people here who do not realise the amount of horses they dealt with and who suffered at their hands.....I repeat again, may they never ever know another happy day or sleep another night #128545; !!!!! I'm presuming the ''missing' ones are the carcasses found. I like the list as one, easier to count up if we are going to do a feature once they are all there; well, the ones we know about. It breaks my heart to think of the foals who probably died and no one even knows their names or who they were and they will not appear on the list. Just so much garbage; so very, very sad. RIP little ones, even though we don't even know who you are it makes us so very sad to think of you. You deserved better. I know it will have been said many times, but how could they do this...? there are more missing than dead bodies that where found !! Did they dig on that farm? Maybe initially they buried them. How long did they live on that farm? 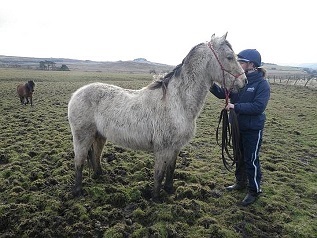 Re the horses that were returned to "Evie" - were they owned by her or loaned to her? Very interested to know the answer to this question. I have only had one dealing with Peel years ago when their stallion paraded at Bramham, I saw her at a trade stand and said " I love Arabs you must be very proud today as I am to see him" she turned her back with no reply! It left me confused, I now know why! They had left some dying at home! 100% support from me in whatever can be done to ensure any of the family never have a horse or any animal in their care again! Spirit 13, I feel deeply for those that have lost and those that are suffering not knowing. I can understand a public forum is not the right place but please share any information that will help via PM to those directly involved. No need to be sorry to me; the way to get something done is to please PM those close to this tragedy with any information that you have that can help. All connections are in many posts all available on PM.